In his essay Graham Harman discusses the difference between recent object-oriented philosophy and the „radical empiricism” of classic American thinker William James. Despite the wit and intellectual freshness of James, his philosophy is found to be wrong for several reasons. First, he confuses the difference between subject and object with that between thought and thing. Second, he is too fond of the continuum and too critical of autonomous individual things. In this way, James either rejects or misses both of the cardinal principles of object-oriented philosophy which the article defends through a reflection on Husserl and Heidegger. 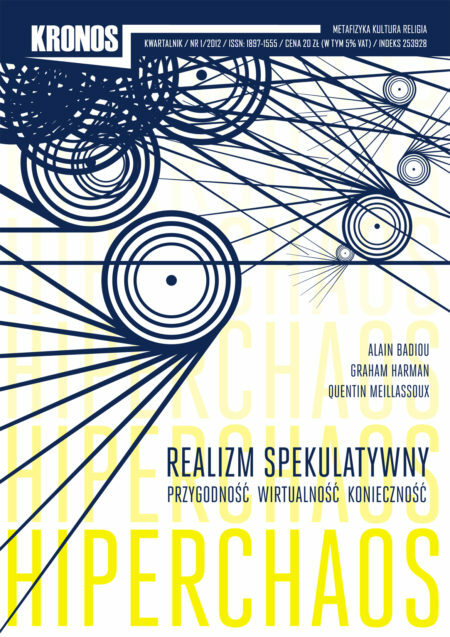 In his analysis of Alain Badiou’s „revolutionary algebra” Bartosz Kuźniarz focuses on various concepts and „mathemata” which Badiou introduced in Logiques des Mondes – the most important book he has written within the last twenty-five years. Kuźniarz argues that the highly formal language of Being and Event is a continuation – and to some degree a sublimation – of Badiou’s earlier, more politically engaged works. Formal discipline ensures the intellectual rigor necessary if one is to act in the name of an Idea. Adorno’s notion of cultural industry implies – among other things – that culture is not the same thing as creativity. “Industry” means standardized production – the exact opposite of a creative transgression of established patterns of thinking, acting and perceiving. In his essay Michał Herrer asks if in our society – which moves away from industrial standardization towards network differentiation, promoting active participation and inter-activity rather than the passivity of a spectator – culture can be said to coincide with creativity. It is precisely the problem of participation or the refusal to participate which today has to be faced by anyone wishing to create without pandering to the needs engineered within the system of cultural management. Jan Tokarski discusses the recently published three-volume Diaries of Jarosław Iwaszkiewicz. Tokarski is interested in the multifaceted character of the writer’s experience: war, politics, loneliness, isolation, failure to communicate with others, old-age and death. In his Diaries, Tokarski claims, Iwaszkiewicz reveals his deeply pessimistic side. He seems to have seen life as pure torment and to have believed that not even in death can we find peace. Death does not restore order and coherence to life as these were never there in the first place - they are merely figments of our own imagination. Krzysztof Rutkowski discusses the aged philosophical dispute concerning the spoken vs. the written word. Speech, unlike writing, is said to enliven and enrich us. It forces us to remember things and thus constantly transforms us. Spirit and life dwell within the spoken word – it is, as Adam Mickiewicz believed, the whole of man, the voice of the people. Thus, within the very core of Christianity there exists a tension between the Spirit and the Letter. The Middle Ages marked the beginning of the Letter’s triumph over speech and the advent of the Age of the Book. A question arose: can books alleviate humanity’s sufferings? Modernity also saw the beginning of another process – that of destroying, burning books. Stanisław Pieróg discusses the evolution of Stanisław Brzozowski’s views on the crisis of modernity and the Enlightenment belief in progress. Brzozowski’s thought is set against the background of various 19th century versions of positivism with their varying interpretations of modernity. Brzozowski initially saw modernity as nihilistic – stemming from the belief in the ultimate relativity of values. However, in his experience as a literary critic – having studied manifold texts of modern literature and having analyzed the attitudes they express – Brzozowki came to the conclusion that the true import of modernity has eluded his contemporaries. In order to recover it Brzozowski turned to Fichte’s interpretation of Kantian criticism and announced the necessity of coining a new philosophy of action which he called the philosophy of labor. Labor of the most unadulterated of the social classes, i.e. of the proletariat, will lead – according to the Polish philosopher – to an overcoming of nature’s chaos and to the forming of a free and truly modern culture. The laborer, in Brzozowski’s vision, becomes the superhuman who reveals the essence of modernity.